The NOTIFIER NH-100(A) Series thermal detectors are addressable sensors that use a state-of-the-art thermistor sensing circuit for fast response. The NOTIFIER NH-100(A) Series thermal detectors are addressable sensors that use a state-of-the-art thermistor sensing circuit for fast response. 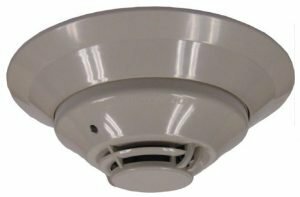 These sensors provide open-area protection and are intended for use with FireWarden Series (FireWarden-100-2 and FireWarden-50) and Spartan(NSP-25) addressable Fire Alarm Control Panels (FACPs). The NH-100(A) and NH-100R(A) sensors provide fixed temperature alarm detection at 135°F (57°C). The NH-100R(A)sensor also responds to rate-of-rise conditions of greater than 15°F (8.3°C) per minute. The NH-100H(A) is a fixed high-temperature detector that activates at 190°F (88°C). These thermal detectors provide addressable property protection in a variety of applications. Two LEDs on each sensor light to provide a local, visible sensor indication. Remote LED annunciator capability is available using an optional accessory, the RA100Z. Unit uses base for wiring. Rotary, decimal addressing: 01 – 99 with FireWarden-100-2, NSP-25, 01 – 50 with FireWarden-50. Factory preset at 135°F (57°C) for the NH-100(A) and NH-100R(A); 190°F (88°C) for the NH-100H(A). 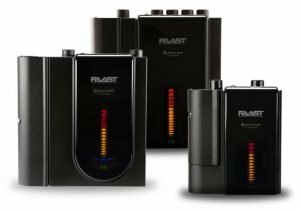 Rate-of-rise triggers at 15°F (8.3°C) per minute for the NH-100R(A). 360°-field viewing angle of the visual alarm indicators (two bicolor LEDs). LEDs blink red in Normal condition and turn on steady red in Alarm. Plugs into separate base for ease of installation and maintenance. Separate base allows interchange of photoelectric, ionization and thermal sensors. Walk test with address display. Remote LED output connection to optional RA100Z remote LED annunciator. NH-100: Intelligent thermal sensor; 135° F (57° C); B210LP base included. NH-100A: Same as NH-100 but with ULC Listing; B210LPA base included. NH-100R: Same as NH-100 with rate-of-rise feature; B210LP base included. NH-100RA: Same as NH-100R but with ULC Listing; B210LPA base included. NH-100H: Intelligent fixed high-temperature thermal detector; 190° F (88° C); B210LP base included. NH-100HA: Same as NH-100H but with ULC Listing; B210LPA base included. 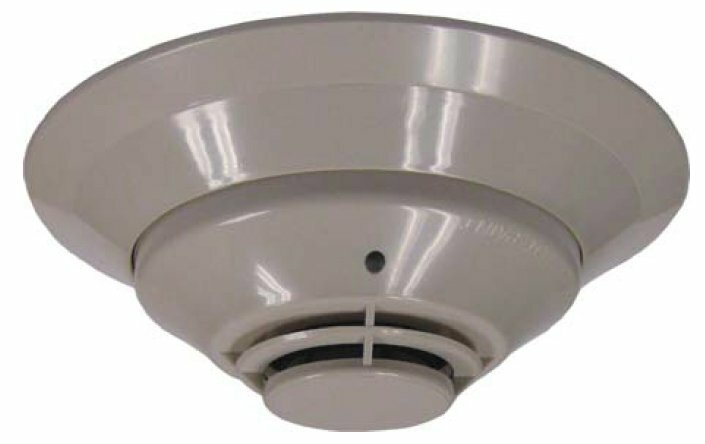 B210LP(A): Plug-in detector base (included); standard U.S. flanged low-profile mounting base. B224RB(A): Plug-in System Sensor relay base. Screw terminals: up to 14 AWG (2.0 mm²). Relay type: Form-C. Rating: 2.0 A @ 30 VDC resistive; 0.3 A @ 110 VDC inductive; 1.0 A @ 30 VDC inductive. 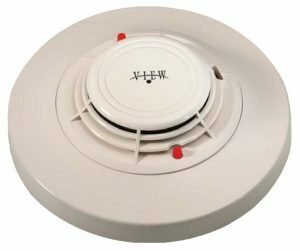 B224BI(A): Plug-in System Sensor isolator detector base. Maximum 25 devices between isolator bases (see DN-6994). RA100Z(A): Remote LED annunciator. 3 – 32 VDC. Mounts to a U.S. single-gang electrical box. For use with B501(A) and B210LP(A) bases only. XR2B: Detector removal tool. Allows installation and/or removal of detector heads from bases in high ceiling applications.